Jumping spiders are able to jump high and their hunting skills enable them to kill preys twice their size. There is more to jumping spiders than meet the eye. Can you believe that among all the members of the spider family, this one spider can fly? Don’t be confused, they jump, but the range of how high they can jump is so impressive that they make it look like they are flying! They can jump up to five times your own height or to be exact, 40 times their body length. Jumping spiders are an attractive and colorful bunch. They can be green or black in color, with designs on their bodies even though they are still hairy. The baby’s body length can range from 12 to 35 mm. Although small, they can kill preys twice their size! It is because of their ability and “equipment” to strategize when hunting for food. Jumping spiders have three pairs of eyes that are fixed and one pair that is movable, which allows them to see their environment in a 360-degree perspective. So, if you are observing them face to face and you move towards their rear, they can still follow your movements. This characteristic is the reason why they can focus on their prey and, at the same time, continually observe and study the environment around them both. Their stereoscopic vision can be compared to how the zoom of camera lenses works; they can take in detail, such as colors and images. Their eyes also contain ultraviolet-sensitive and green-sensitive pigments that allow them to calculate the distance between them and their prey. Their eyes are not used for hunting and navigation alone because they also use these for courtship. 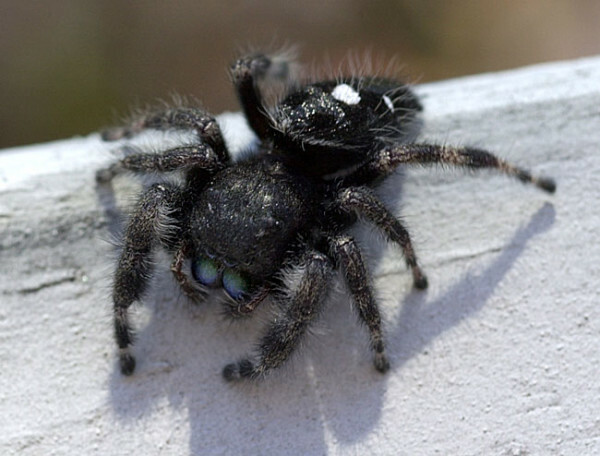 The male jumping spider has iridescent eye color, while females have plainer ones. According to Wikipedia, jumping spiders have a “well developed internal hydraulics system [that] extends their limbs by altering the pressure of body fluid within them.” This is the reason why they have a very powerful jump! But what is hydraulics, you’d ask? Hydraulics is the process where we get energy from the motion of liquid. Jumping spiders are also prepared whenever they jump. Before they jump, they will tether a filament of silk to serve as drag line in case the jump fails. If they fail, they will simply climb back up on the silk. No sweat! Bungee jumping, anyone? The minute the jumping spiders detects a prey, it will inspect it, and if no danger is present, will then go near the prey and attach a drag line before springing on them. It is also observed that they don’t follow a straight path to the prey. They will circle them, sometimes going through paths where they can’t even see their target in sight. Jumping spiders are members of the Salticidae family and are usually found in deserts, scrub lands, intertidal zone, mountainous regions and their favorite are tropical forests like the Himalayas and Mount Everest. Is the Jumping Spider Poisonous? The jumping spider is not poisonous to humans. If you get bitten by a jumping spider, Unless you are allergic to spider venom, you will notice that the area bitten will have a significant swelling and is painful and itchy similar to the symptom of a wasp bite. It becomes serious when you experience chills, headaches, vomiting and painful muscle and joints. When there is no sign of serious symptoms, you can wash the bite and apply antibiotic ointment. If unsure that you are exhibiting serious symptoms, call your doctor. One of these spiders was in my car today. I pulled over to either run it out of Dodge or kill it. Neither happened, he/she got under my passenger seat. The hairspray is coming out before I leave work.